If you have ever dreamed about what it would be like living in the historic Vieux Carré, or French Quarter of New Orleans, then the Soniat House is for you! Edward Nesta and I have been to New Orleans many times, and have always dreamed about what it would be like living in the historic Vieux Carré, or French Quarter of New Orleans. 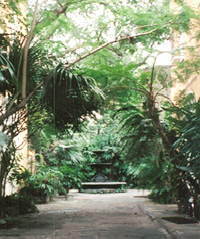 In August 2004, we decided to experience it by staying at the Soniat House, a member of the Small Luxury Hotels of the World www.slh.com located in the heart of the French Quarter in the residential section of Chartres Street. This charming hotel consists of two luxurious townhouses and a cottage. Mr. François Boisdoré built the main townhouse in 1829 for wealthy plantation-owner, Mr. Joseph Soniat Dufossat, which was subsequently purchased by present owners, Mr. and Mrs. Rodney Smith in 1982. In 1834, Mr. Dufossat had another townhouse built directly across the street for his son, which the Smiths acquired about 10 years ago. There are 24 rooms in the main building, 9 across the street, and a 2-story cottage is conveniently located just around the corner, which has its own courtyard. After ringing a bell to enter, Linda welcomed us to Soniat House, and explained the hotel’s amenities, such as the comfortable sitting room off the reception area, where guests can use the honor bar to have a cocktail, or use the Internet, although there is wireless Internet access throughout the hotel. Cyril, followed by Clarisse, showed us to our suite, number 28 on the 2nd floor, which we found out, was Clarisse’s favorite place in the hotel. 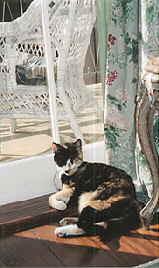 Clarisse, a sweet calico cat, is the unofficial greeter at the hotel. We entered our suite through a long foyer painted celadon green with creamy wide baseboards, a chandelier and soaring 12-foot ceilings. We passed an enormous floor to ceiling mirror, located just outside the comfortable bathroom with blue and white striped wallpaper with a vine print, a table lamp as well as recessed lighting to provide just the right lighting, a combination tub/shower and ETRO amenities from Milan. Our large sitting area had an original oil painting over the fireplace, an antique desk, curved red silk sofa, a comfortable chair that Clarisse had to sit in while paying us a visit, and a wooden chair with needlepoint cover, an assortment of tables, as well as other original sketches and paintings. Floor length chintz covered the floor to ceiling windows, which led out to the pièce de résistance, the large green-shuttered balcony with lacy cast-iron railings overlooking Chartres Street. A ceiling fan on the balcony provided a cooling breeze as we relaxed in the white wicker chairs. Large pocket wooden doors divided the sitting room from the large romantic bedroom complete with another fireplace, King 4-poster bed painted teal and sumptuously dressed with an ivory silk and lace canopy, and matelasse cover. There was another original oil painting over the fireplace, and a television, although with all New Orleans has to offer, we weren’t sitting around watching the television. Our large closet had 2 Frette robes, a large safe, hairdryer and umbrella, which we were fortunate not to have to use. Despite the sultry steamy temperatures of New Orleans in August, we had our breakfast of freshly baked hot buttermilk biscuits, with butter, whole strawberry conserves, orange juice, hot milk and coffee served on an oval silver tray with Villeroy and Boch china and linen napkins delivered to our balcony. Although it would have been cooler to have breakfast in the pretty shaded brick courtyard with banana trees, and a fountain with koi fish, we wanted to experience French Quarter living from our balcony. Clarisse, who decided to pay us a visit as Cyril delivered our tray, looked out the window at us from inside the air-conditioned sitting area, and I know she was laughing at us. We took a tour of this historic hotel and the cottage as well, and marveled at the lavish décor in each of the guestrooms. Each room rivals the next not only in its décor, but in the individual bed designs as well. Mr. Smith travels around the world selecting just the right antiques for not only the hotel, but also their antiques shop, Soniat Antiques. Like the hotel, they keep expanding, and now have 3 locations adjacent to the hotel, which specialize in 18th and 19th century mostly French painted, fruitwood, and other light wood furniture, some Swedish pieces, trunks, beds, chairs, ornate canopy frames, Italian chandeliers and sconces and other objects d’art. Due to Soniat House’s location in the residential area, although you are in the heart of the French Quarter, it affords quiet and privacy. It is located across the street from Saint Mary’s church and next door to the Beauregard-Keyes House and gardens. For us, it gave us a taste of what living in the French Quarter would be like – absolutely perfect. To read more articles on New Orleans please read our articles in Hotels & Resorts, Restaurants, Chefs’ Recipes, Events, Liquor Cabinet, Music Scene and Art & Antiques. For information on New Orleans, please visit www.neworleanscvb.com. © October 2004. Luxury Experience www.luxuryexperience.com. All rights reserved.